I always get a bit nostalgic this time of year and lately I have been thinking about our travels this time last year. We were living and traveling in our RV slowly making our way south after visiting Newfoundland, Cape Breton and other points north. Aaaahhhh! Beautiful, lovely places. Our last stop before reaching Florida and family for the holidays was Charleston, SC. We had visited several Civil War related sites on that journey so how could we not make a visit to Charleston - home to Fort Sumter and the H.L. Hunley. 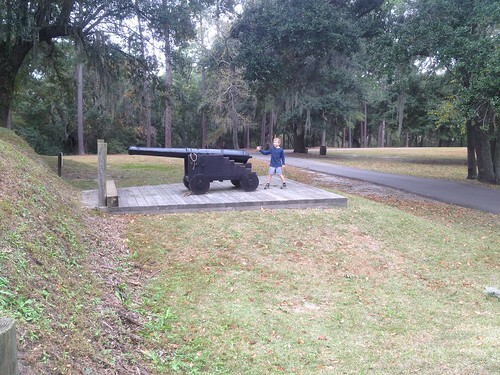 During our stay, however, we discovered another fascinating historical site that pre-dated Civil War Charleston and was, in fact, the site of the first permanent european colony in South Carolina, Charles Towne Landing. It is located across the Ashley River from modern day Charleston on Albermarle Point. Bordered as it is by a river on one side and a marsh on the other, the original settlers hoped the location would lend itself to protection from any Spanish ships. Those original settlers still felt additional protections were needed though so earth works and other fortifications where quickly built as well as gardens and houses. Many of these have been recreated for modern day visitors. Charles Towne Landing is currently owned and operated by South Carolina State Parks and includes many different components from historic gardens to mansion ruins. Archaeology is ongoing at the site as people seek to uncover the rich history of the area that includes Native American, European, and African American peoples. The park does a decent job of sharing this history via various interpretive displays and reenactments that include a museum and a replica coastal cargo ship called The Adventure. On our visit, the ship was definitely a highlight for my then 5 and 7 year old children. In this video, interpreters are showing them how to operate the pulley system that was used to load and unload heavy cargo. Additionally, the park attempts to interpret the natural history of colonial Charles Towne with the presence of a small but impressive zoo. I didn't take a many pictures on our visit, but here is a video of my toothless daughter being stalked by the resident cougar. For a full description of the park and all it has to offer check out the park website.